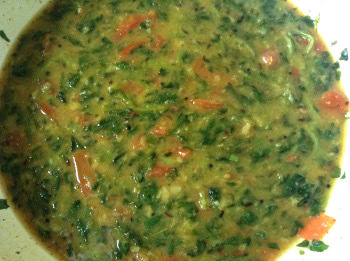 This methi dal - fenugreek leaves dahl' is a simple and easy recipe. 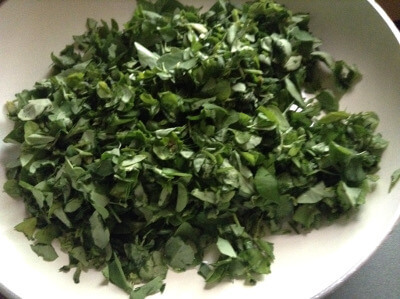 I like methi - fenugreek leaves and I think this is a yummy way to eat the greens and get the nutrients such as iron. In winter season, methi / fenugreek is available in plenty. So that is the right time to make methi / fenugreek recipes. You may use the methi - fenugreek leaves along with the tender stems for this dal recipe. 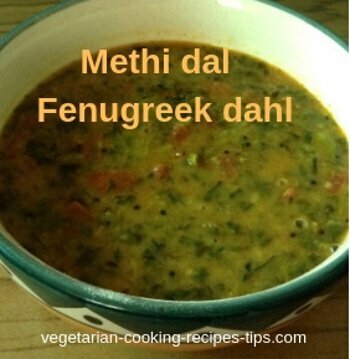 You may cook methi - fenugreek dal on the stove top in a pot/pan if you wish. 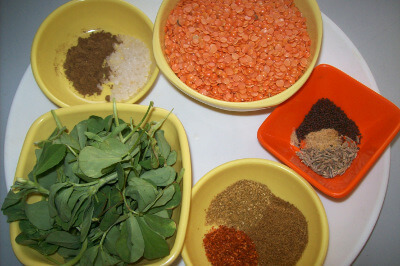 You may use pressure cooker for cooking methi - fenugreek dal recipe as that really saves time. 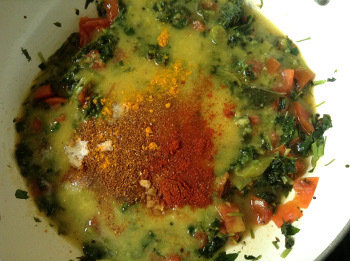 I am using masoor dal with methi leaves today. But you may use moong dal or toor dal or a mixture of dals. This methi - fenugreek dal recipe goes well with plain steamed rice or any flat breads such as chapatti, paratha, nan etc. Cooking methi - fenugreek dal using pressure cooker. Cooking methi - fenugreek dal on the stove top. Wash the dal and add to the pressure cooker along with 2 cups water and chopped methi. Add the ingredients from dal to turmeric powder to the pressure cooker. Close the pressure cooker and let it cook till 1 whistle. Switch off and let cool. When the cooker has cooled, stir the dal mixture, check for consistency. Add salt, tamarind pulp (if adding) , sugar or jaggery and let boil for 2-3 minutes. To make tempering - see the image below. In a pan, heat oil/ghee. Add mustard seeds. Let splutter. Add cumin seeds and all the other ingredients one after another. Take off the fire. Add it to the mixture in pressure cooker. Mix well. Serve hot with plain rice or with any flat breads such as chapatti, nan, paratha etc. If cooking dal on the stove top in a pot/pan, wash and soak dals for 15-20 minutes before cooking. This will reduce cooking time. You may also cook dal without soaking. Add 2 cups water to the pan along with washed dal. Bring to boil and cook till just done. This will take about 10-12 minutes for masoor and moong dal. If using toor dal, it will take about 20-25 minutes. Or you may cook dal in a separator in the pressure cooker and then follow the process given below. 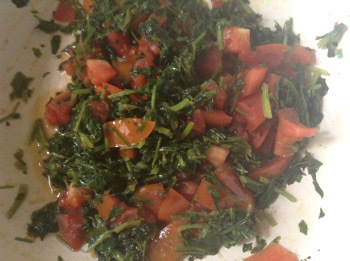 While the dal is cooking, make the tempering and cooking the methi leaves as given below. Heat oil/ ghee in a pan/kadai in which you are planning to make dal. Add mustard and cumin seeds and hing/asafotida. When they stop spluttering, add chopped methi/fenugreek leaves. Stir and cook for 2 minutes or till the leaves look wilted which will take only 2-3 minutes. 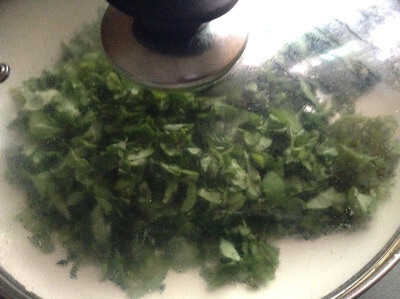 You may cover and cook methi leaves for 2-3 minutes. Add chopped tomatoes, if adding. Cover and cook for 4-5 minutes till tomatoes start to lose shape. Add cooked dal, all the spices, red chili powder, garam masala, turmeric powder, salt. Add jaggery / sugar if adding. 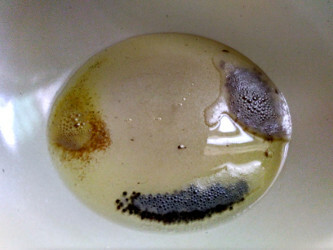 Stir well and add water according to the required consistency. It should not be watery. Dal is usually a bit thick. Cook for 4-5 minutes. Take off fire. Serve hot with rice, roti etc. For this methi - fenugreek and lentil recipe, you can use split mung bean (mung dal or green gram dal) or red lentil(masoor dal) or split yellow lentil/ toor dal/tuvar dal/arahar dal. You can use any one dal mentioned or a mixture of all the three dals. If you are using a mixture of the three dals, remember that mung dal and masoor dal cook faster than toor dal. So washing and soaking toor dal for 15-20 minutes before cooking is better. That way all the three dals will get cooked at the same time.